This curriculum packet consists of information and primary documents related to the history of Washington's forests. These materials are intended to provide students with an opportunity to investigate attitudes toward and uses of this natural resource. Middle school students may find some of the documents to be challenging reading, but most of the documents could profitably be used in a middle school, high school, or university course about the history of the Pacific Northwest. Although these curricular materials deal specifically with events in Washington state, they could also furnish a useful case study for general U.S. history and geography classes. Teachers can use this packet in a variety of ways. They could use a handful of primary documents to supplement existing readings and lesson plans. This packet also contains sufficient materials to allow teachers to create a new teaching unit lasting anywhere from a few days to several weeks. Forests have shaped Washington's history for hundreds of years. 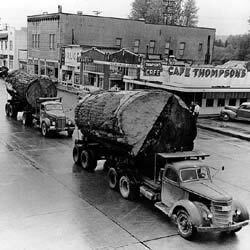 The forests were of utmost importance to the economic development of the state, but Washingtonians also relied on minerals, farmlands, and fish stocks. In many cases, the use of one natural resource was connected to another. Forestry and agricultural activities, for instance, have often damaged Northwest salmon runs because of soil erosion and pesticide run-off. Thus, an in-depth focus on Washington's forests is intended to lead to broader consideration of the history of natural resource use in the Pacific Northwest and the United States. Students and teachers can therefore use this material as a doorway to other projects about natural resources. The most important part of this packet is section VI. This section is a gateway to a collection of primary source documents on a wide range of topics related to forests, including the lumber industry, loggers and their unions, government forestry policies, and environmentalism. Testimonies from early explorers, pioneers, and lumber executives allow students to examine how people's expectations of Washington's forests changed over time. Photographs of logging operations and letters, diaries, and reminiscences from loggers give students the opportunity to assess the dangers and appeals of working in the woods. Papers from environmental organizations and government agencies let students explore how these groups approached the management of the forests. These documents thus offer many different points of view on Washington's forests. The other parts of the packet contain materials to help teachers use the documents in the classroom. Section II is an essay designed for teachers; it examines the forces and events that shaped Washington's forests from the late 18th century to the present. Section III is a time line designed to help orient students to the basic chronology of Washington's forest history. It will also help students place the documents in a particular time period. Suggestions for classroom activities based on the primary documents can be found in section IV. In addition, section V presents a bibliography of resources that could be used to supplement the documents in this packet. This bibliography lists books, videos, and Internet resources that teachers may find useful; it also describes possible activities outside the classroom, including field trips to museums and guided visits to forest sites.